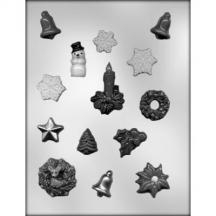 This mold provides several terrific designs that are perfect for the holiday season. Pieces range from Snowflake 1-1/8" Diameter to 1/8" to Candle 1-5/8" x 2-3/8" x 1/4". Estimate 75 pieces per pound of chocolate.